My dear faithful readers (hi Mom! ), I apologize for my delay. My duties as a frequent flyer got in the way of my trip report, for which I apologize somewhat half-heartedly, as I did a really enjoyable mileage jog to Easter Island over the weekend. If you’re salivating about what the trip report for those flights will look likIT WAS 6 FLIGHTS IN COACH ON A LAN 767 AND 2 ON AN AMERICAN S80…done. That trip report (at least the cool parts) will come once I’m done with this China one, so at my current rate that means…November. It’s hard leaving the Great Wall, but it was time. I made my way back to where Simon was dutifully waiting for me in the parking lot. We made our way back towards Beijing when his girlfriend called. During the conversation I encouragingly nudged him with my elbow and went “eh? eh?” with a hilarious look on my face, and to his credit he neither punched me in the face or kicked me out of his car/country. Our next destination was Beijing’s Summer Palace. Those who have been to the Summer Palace will note that the above looks precisely nothing like Beijing’s Summer Palace, because the above picture is not of Beijing’s Summer Palace. Instead, it’s a picture, either taken from a plane or a person with a big trampoline, of Texas A&M University. I’m a proud graduate of this institution. Front and center is the Systems Building. Above and to the left (the taller building) is the Oceanography and Meteorology Building. Elsewhere, you’ll find the Academic Building, the Engineering Industries Building, and the Liberal Arts Building (among other boringly named buildings). Stay with me, there’s a point to this. Ok, so now here’s a picture I took of the Summer Palace. WOULD YOU LOOK AT THOSE BUILDING NAMES! I will now type the first three that I happen to look at: Freshness-Embracing Pavilion. Cloud-Entertaining Eaves! HOUSE OF CLEAR WATER AND COOL BREEZE! Whoever names the different deodorant scents would have a field day with these names. So, the takeaway from this first section is that Beijing’s Summer Palace is more creatively named than a university in College Station, Texas. You get what you pay for, folks. 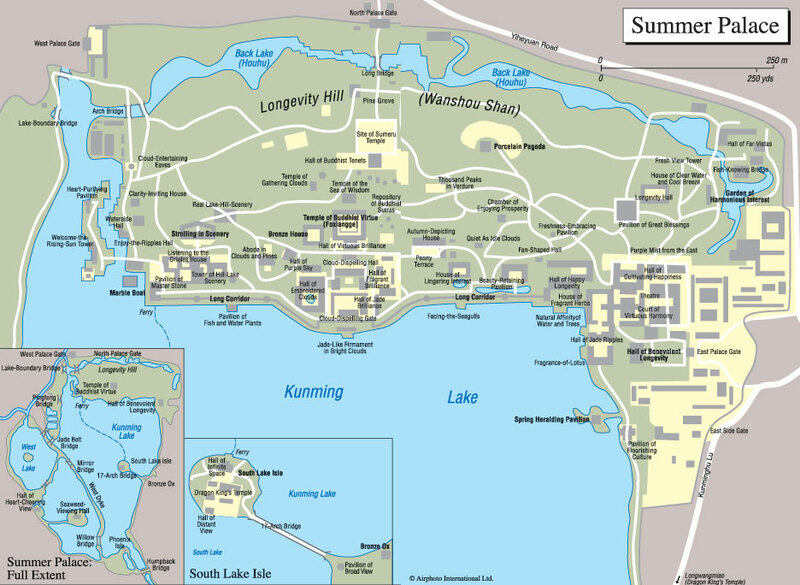 Simon provided me with a really nice map of the various buildings in the Summer Palace. There are around 7 billion different temples, eaves, pavilions, and pagodas in the Summer Palace, and I’m sad to say I didn’t visit them all. What I loved about visiting the palace was seeing all of the Chinese families out enjoying their country’s history. I find that eastern cultures look to the past more to find their identity while western thought tries to find it in a future hope. Neither’s right or wrong I guess, just different. Either way, seeing the kids playing in the various courtyards while their parents looked on warmed my heart, which was good because it was a bit chilly. I arrived at the East Gate and was told to generally head northward and had Simon’s cell number in the phone he gave to me so I could call him when I was done and he would swing by and pick me up. I wish I remembered the names of all of the buildings I went into, but alas I do not. This post will be largely picture-based, which is ok because I think I ran out of hilarious earlier. The bits of history I do remember tell me that this site has been set aside by the emperors of China all the way back to the 1100s, with the biggest expansion in the late 1800s. There’s a massive lake that takes up a large part of the property which abuts Longevity Hill, which was named to celebrate the 60th birthday of an Emperor’s mother. So, if mom is getting close to 60, better work on finding a hill to name after her grand feat of Living. It’s a UNESCO World Heritage Site and blah blah here are some more pictures. Haha, I kid (slightly). It would’ve been darker. Anyway, I fought through my miserable cough to see some more great buildings and examples of imperial Chinese architecture. I started to head in that direction, keeping my eye out for The Long Corridor. You’re never going to guess this, but it’s a really long corridor. I entered many a corridor thinking “is this the one?” But, you know what they say, “If you have to ask, it’s probably not the Long Corridor.” (I don’t know where else they say that besides here). Well, I finally found it! Check out the detail on each of the upper crossbeams! It’s 728m long (that’s almost 729m!) and has over 14,000 drawings. It separates the lake from Longevity Hill. I walked all the way down and back, which got me all good and tired before I climbed the buildings on Longevity Hill. The buildings and temples to Buddha were awesome. It was only later that I found out that the empress who commissioned the restoration in the late 1800s paid for it by diverting funds (3 million pieces of silver) from the navy, which by no coincidence lost the first Sino-Japanese War only six years later (maybe unrelated, but worth mentioning). And yes, I sourced a lot of this history from Wikipedia, since I delayed this trip report so long I forgot a bunch of it. I coined the term pollutionery atop Longevity Hill, as it was so penetrating that you couldn’t really help seeing the pollution instead of some of the buildings! At the top of the hill I realized I was pretty close to the North Gate where Simon would pick me up, so I lingered a bit, and CAUGHT SOME YOUTHS STARTING A REBELLION! I left the Summer Palace and gave Simon a call. I felt pretty elite as his car appeared almost out of nowhere, stopped in the middle of traffic, and waited until I got in before appeasing the screaming horns of the cars he stopped in front of to drive off. I recently found an interest in good food (either a blessing, taste-bud wise, or a curse, wallet-wise) and discovered a chap named Heston Blumenthal, only one of the most famous and well-recognized chefs in the entire world. He has a series of shows on BBC discussing the most perfect versions of certain foods that he’s been able to devise, and one of the episodes focused on Peking Duck. For those of you who don’t know, Beijing used to be known as Peking, so Peking Duck is pretty much what you have to eat when you’re in Beijing. Heston, in his research on the dish, came to a place called DaDong in Beijing. DaDong, he explained, delivers a modern interpretation of the classic dish. My hotel, the Red Wall Garden Hotel, was actually pretty close to the restaurant, so I had Simon make a call for me to get me a reservation for that evening. I specifically forgot to bring some nice dinner clothes, so embarrassingly showed up to the restaurant dressed very casually. They still let me in, thankfully, and I looked forward to a great experience. I was seated and given a menu with about 324857543 pages. After six seconds of being seated, I was asked if I was ready to order. No, I was not, I was currently figuring out how to open the menu. The complexities were revealed and I had a look. Everything looked absolutely fantastic, and the menu was a beautiful piece of art itself, with wonderful photography of the various options. I settled on a half-duck (plenty for one person) and two starters. My meal began with a beer and my first starter, which was a type of goose if I remember correctly. Then came my second starter, the fruit salad. The above certainly isn’t what I had in mind when I asked for fruit salad, but each one of these little bites was INCREDIBLE. All of the flavors worked so perfectly well together. Then, a chef showed up next to my table and began to prepare the duck. He sliced, diced, friced, etc. He then artfully arranged it on my plate. Until that moment, I don’t think I had ever tried duck. I had my first bite and was almost inappropriately taken by the skin almost dissolving in my mouth as the tender meat surrendered its juices to me. I was having a nice little food moment when the waitress brought my Plate o’ Sides. I sat there, smiling politely, because I had literally no idea what to do at this point. She very professionally and only mildly condescendingly showed me that I was supposed to take a crepe-looking thing from the bowl in the upper right, put a bunch of stuff from the Plate o’ Sides on it, add a piece of duck to it, and unleash hell. Thankful and only mildly embarrassed, I chowed down on the duck in the since-learned proper fashion. Every bite was better than the one before. After the duck, they brought out some soup and some candied balls of some sort of mousse-chocolate, something like that. Both were delicious and I’m proud to say I didn’t need an explanation on how to eat them. Then they brought out a massive smoking dish with some clementines on it as a finale to a great experience. I was sitting there taking in the spectacle of everything when the waitress thought that perhaps I didn’t know how to peel a clementine. So I stupidly had to sit there looking interested while she showed me how to do it. Being a grown human of more than 3 years I was able to peel the others with ease. The sweetness of the clementines was a nice balance to the entire meal. I was nervous about getting the bill, but it was incredibly reasonable, and now I know where I will always go when I’m in Beijing! When I woke up that morning I said to myself “Ah, my first full day in Beijing, and…my last full day in Beijing.” Sounds crazy, but it was true. I wanted to fit everything in I could and Simon ensured I did. Simon and I parted ways after the Summer Palace. I wouldn’t need him the next morning because the places I wanted to visit were so close to the hotel: Tiananmen Square and the Forbidden City. See you next time! Exactly my experience when I was in Beijing. Nice blog, Andy!